The Timewise 650 checkpoint clock for TSD rallies and "Pro-Rally" stage events provides rallymasters, rallyists, and checkpoint workers with an accurate and easy to read digital time of day clock. This time of day chronometer uses a 6 digit, 0.5" tall character, extended temperature range, high humidity tolerant LCD that assures easy readability, even in direct sunlight. A quartz crystal oscillator accurately maintains the time to within one second over 36 hours. The 650 rally timer uses a microcomputer designed for applications where ultra-low power consumption and a wide operating voltage play a significant role in product specification and selection. Large scale integrated CMOS technology keeps component count and power dissipation to a minimum, while simultaneously providing increased reliability. Toggle switches give positive tactile feedback. Placing the switches on the left side frees the right hand to record data. A rotary switch is used to select the operating mode. Time is displayed in the standard six-digit format of hours, minutes, and seconds (11:59:59). Alternatively, the 650 rally clock can display hours, minutes, and hundredths of a minute (11:59.99). You can view time resolved to tenths of a second (59:59.9) or thousandths of minutes (59.999). The clock can also count in the twenty-four hour format (23:59:59 or 23:59.99). The clock can be easily set to any hour, minute, and second (or hundredths of a minute). The clock can adjusted at any time (even by fractions of a second) up or down! You can switch between counting in seconds or hundredths of minutes at any time. To prevent accidental loss of time, there is no "on-off" switch. A simple, but secure, clock setting procedure is used. The 650 checkpoint timer can "split" the current time as a rally car enters a checkpoint. Effectively, the clock is visually frozen, while continuing to count internally. The 650 can store up to 50 split times in memory. You can review logged split times forward or backward in time. You can recall each stored value, again, after having previously observed it. 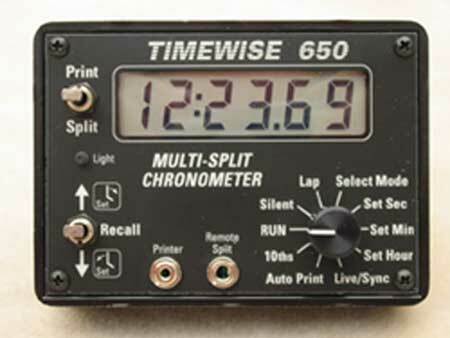 A lap split timer is also provided. When viewing the lap timer, activation of the split switch displays the frozen elapsed time from the previous lap split action. The lap timer is simultaneously restarted internally. A time of day split value (separate from the regular split time of day memory log) is also linked to the lap split time, allowing notation of the time of day at which the lap split was executed. A buzzer that signals activation of each split action can be enabled or disabled. A remote split input is provided for use with optical or pneumatic switches that signal when a vehicle passes. The buzzer can also sound whenever a remote split input is activated. One Timewise 650 can automatically set the time in another 650 simply by interconnecting a common stereo audio cable. This master/slave clock setting procedure can take place at any time. The slave will be synchronized to within three milliseconds of the master. For nighttime use, the display can be momentarily illuminated with an internal LED light source. An optional 9 volt input for continuous lighting is available. Finally, an optional RS-232C interface is available for sending data to a printer or computer. Contact Timewise for more information. To view the Timewise 650 Instruction Manual in PDF format, click here. This 24 page booklet formatted document (66KB) includes a functional description of the 650, as well as detailed specifications. To access a two page Timewise 650 brochure in PDF format, click here.